The Toyota Yaris is a smart and practical supermini with a spacious interior, rivalling the Ford Fiesta, Peugeot 208 and Hyundai i20. It's available with either three or five doors, and in four trim levels. Entry-level models are sparsely equipped, but go for a mid-spec TR model and you'll get 15-inch alloy wheels, air-conditioning and a 6.1-inch touch screen sat-nav with a reversing camera display built in. The engine range includes two petrols and one diesel, which are fairly efficient, but for the ultimate fuel-saving version go for the Toyota Yaris Hybrid, which emits 79g/km and returns an excellent 80.7mpg. 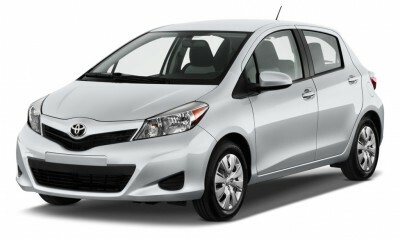 The Toyota Yaris has a sportier design than it used to, thanks to it having a lower roofline than the previous model. It's not the most head-turning design, and the new Peugeot 208 beats it on the style front. The nose and grille echo the rest of the current Toyota range, while the rear bumper and tailgate look rather like the larger Toyota Auris. Although there are some neat interior touches, but on the whole inside the car it feels a bit dated and certainly not as nice as the rival Volkswagen Polo. There are four specifications to choose from, and entry-level T2 models only get 15-inch steel wheels and black door handles - very spartan. However mid-spec TR versions get 15-inch alloy wheels, electric door mirrors, air-conditioning, Bluetooth and a clever 6.1-inch touchscreen display that features sat-nav and a display for the reversing camera. The sportier SR spec adds a roof spoiler and sports suspension, and top-spec T Spirit models include a panoramic roof, auto lights and wipers, front fog lights, dual-zone air-conditioning, and keyless go. Buyers can choose between two petrol engines, one diesel engine and a hybrid petrol-electric. The petrol engines are a 1.0-litre unit with 69bhp or a four-cylinder 1.33-litre engine with 99bhp. Performance from the 1.33-litre engine isn't too bad, but because you need to work it quite hard to extract the power it can be a chore to drive in some situations. Buyers doing more miles might want to consider the 89bhp 1.4-litre D-4D diesel, which goes from 0-62mph in 10.8 seconds and on to a top speed of 109mph. The Toyota Yaris hybrid gets a 1.5-litre petrol engine with a small electric motor that produce 98bhp together, and can launch the car from 0-62mph in 11.8 seconds. However the standard CVT automatic gearbox makes the car feel slower than its stats suggest. A noisy whine accompanies the throttle and it really puts you off when putting your foot down. The revs can't settle at motorway speeds either, making it irritating to drive - and the wind noise is just too much as well. The Yaris is most at home at slow speeds in town, as the steering provides very little feedback, there's not enough grip in corners and body control is poor. In short, it's far less engaging to drive than a Ford Fiesta. A five-star rating from crash test experts at Euro NCAP means the Toyota Yaris can be considered a try safe car - especially as it received 89 per cent for adult occupant and 86 per cent for safety assist. You get seven airbags as standard, as well as stability control, brake assist and traction control. The Toyota Yaris had a strong result in the 2013 Driver Power customer satisfaction survey, coming in at 35th in the top 100 cars. The engine range is all tried and tested, and Toyota's five-year, 100,000 mile warranty is included - so you can expect excellent reliability overall. Thanks to an extra 100mm over the old Yaris, it's more practical than ever - and it was pretty good before. The boot is 286 litres - that's 25 per cent more than it was before, and there's more luggage space than in the Volkswagen Polo. You can fold the standard split-folding rear seats down to create a 768-litre space in the back, which is good for a car of this size. Despite having a lower roofline than the previous model this new Toyota Yaris has plenty of rear leg and headroom - and thanks to the flat floor in the back three adults can easily fit in. There are plenty of cubbies and storage spots around the interior, too. The raked A-pillars do cause nasty blindspots, though. The entire engine range has a big focus on economy, and even the entry-level petrol engine manages 58.9mpg and CO2 emissions of 111g/km. The more powerful 1.33-litre engine returns 52.3mpg and 123g/km, but when combined with the Multidrive S automatic gearbox it's even better on fuel, returning 55.4mpg and 118g/km of CO2. The diesel version is very cheap to tax, thanks to emissions of just 104g/km of CO2, and it gets 72.4mpg as well. Thanks to emissions of just 79g/km and a claimed economy figure of 80.7mpg, the hybrid is the cheapest model in the range to run, and it costs nothing to tax. However the 88mpg Kia Rio1.1D beats the Yaris on economy.